This guide will outline the various steps for faculty, researchers, and students to deposit work to Open Research. 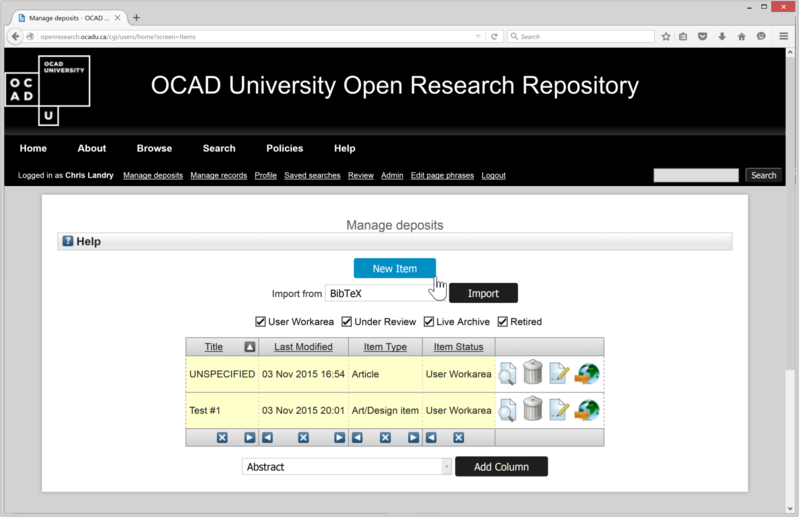 Log in by entering your OCAD U login credentials. Graduate Students: For guidelines, forms, dates and deadlines related to theses and MRPs please visit the Graduate Studies site. 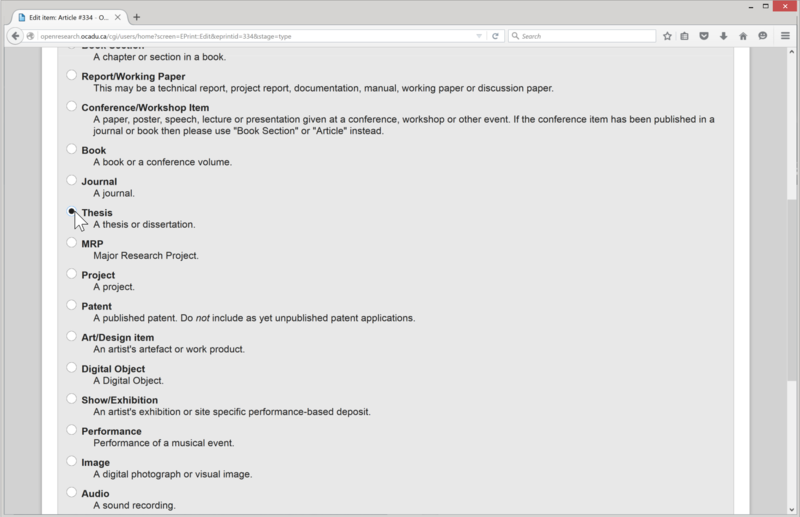 Deposit Your Work in Open Research: A Guide for Faculty. Deposit Your Thesis or ETD. What kind of item are you depositing? 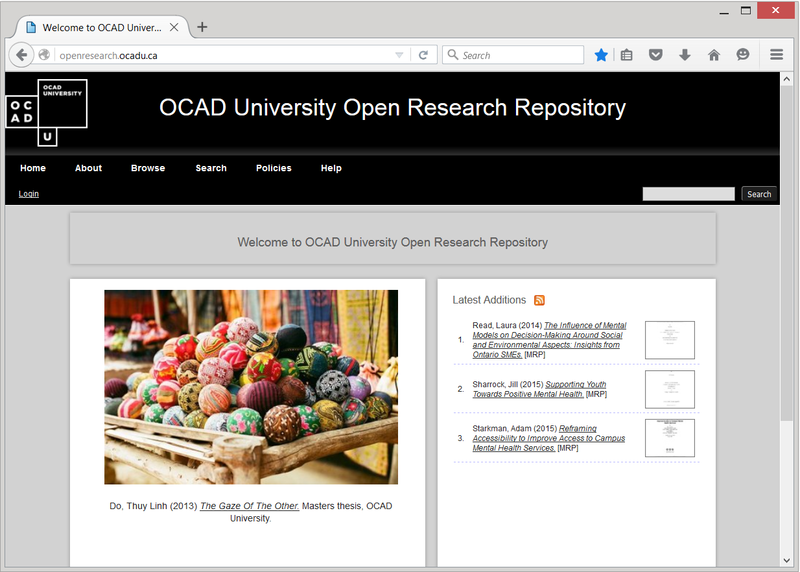 If your item type is not listed, contact Chris Landry, Scholarly Communications Librarian at clandry@ocadu.ca or repository@ocadu.ca for assistance. 1. 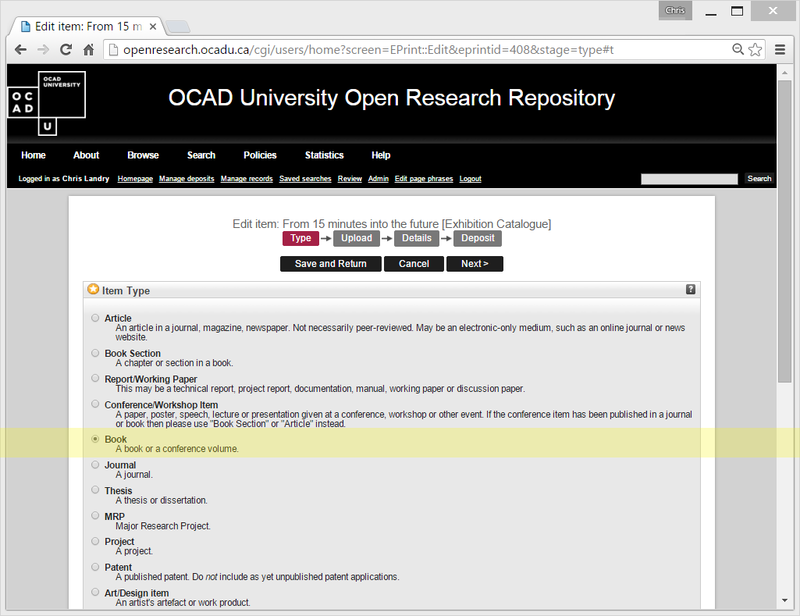 Visit Open Research repository at openresearch.ocadu.ca. 2. Login using your OCAD University credentials. 3. From the Manage Deposits page click on the New Item button. 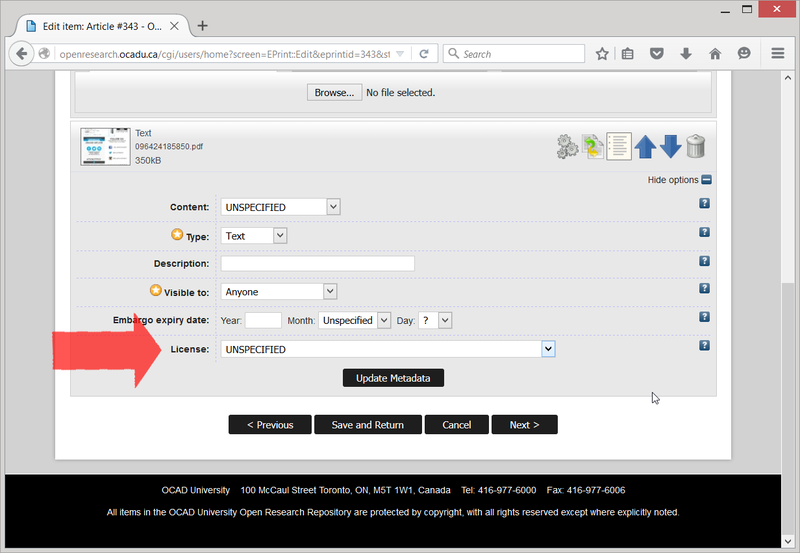 *Note: If you know the digital object identifier (DOI) for your item you can paste it in using the Import from dropdown in order to pre-populate some metadata fields for your submission. 4. Select your Item Type and click Next. 5. Upload your item(s). Ensure that your submission does not contain any copyright-protected material that you do not have permission to use. If your submission has been previously published,SHERPA/RoMEO is a valuable tool to verify publisher policies. If you are unsure contact the library at repository@ocadu.ca. Fill in the applicable publication details, particularly the License terms for your submission. 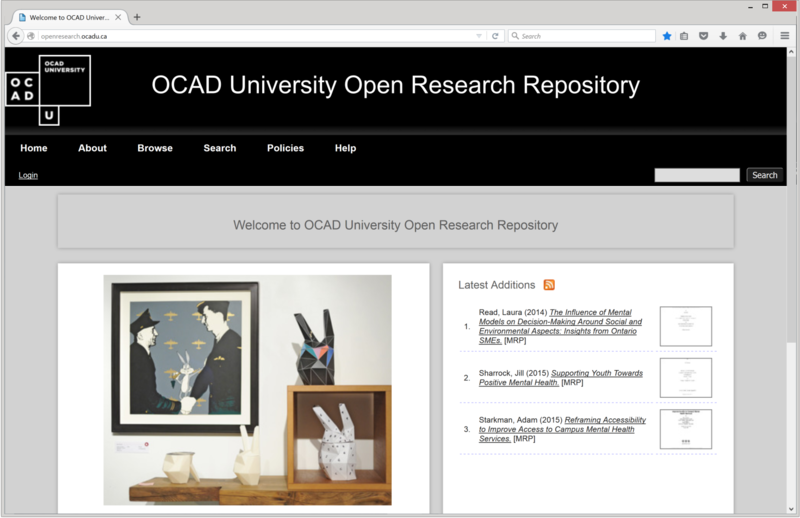 If you have any questions about Creative Commons licenses, contact us at repository@ocadu.ca. 6. Fill out the appropriate fields such as Title and Abstract. Be sure to add any applicable Uncontrolled Keywords. Under Creators it is a good idea to include your email address along with your name. Doing so does not mean your email will be listed in the record, but rather it will provide a unique identifier for you as author and allow the system to generate your personal download statistics. 7. Note: Division refers to the faculty, department or research team associated with your deposit. If more than one of these applies you may select multiple divisions by holding down the Ctrl key or the command key on a Mac. 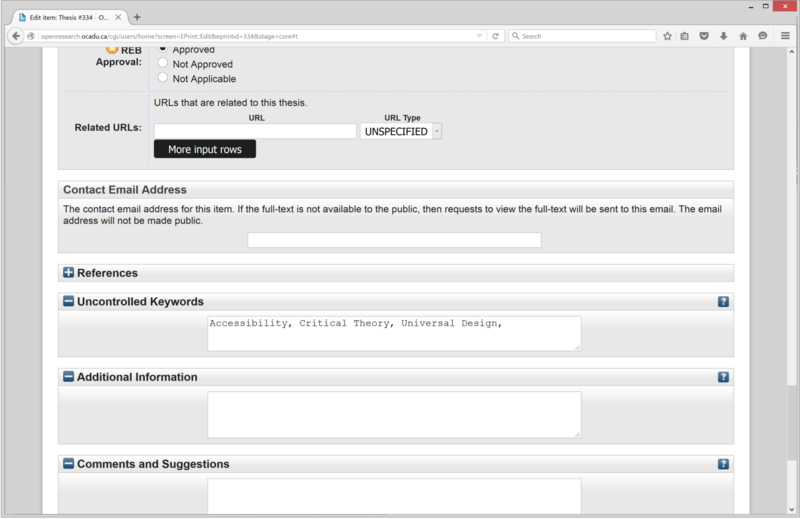 Uncontrolled keywords are natural language terms you can add to reflect the content of your item. Keywords should be listed on the Abstract page of your thesis or MRP. 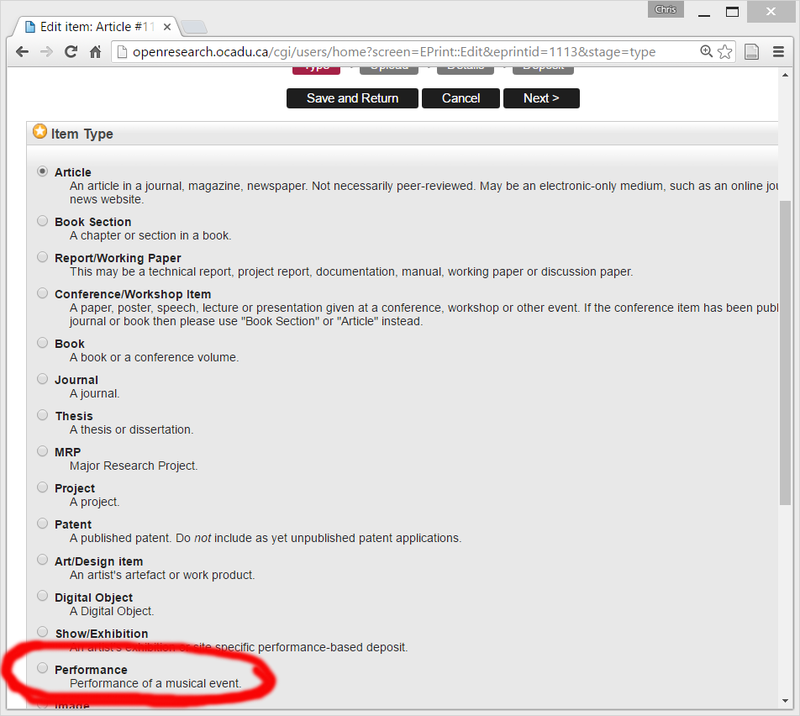 We recommended that you add keywords to help searchers discover your paper. Consider which words people might type into a search engine to try to find your work via a Google or database search. For References cut and paste your list of works cited. 8. Complete the process by clicking the Deposit Item Now button. 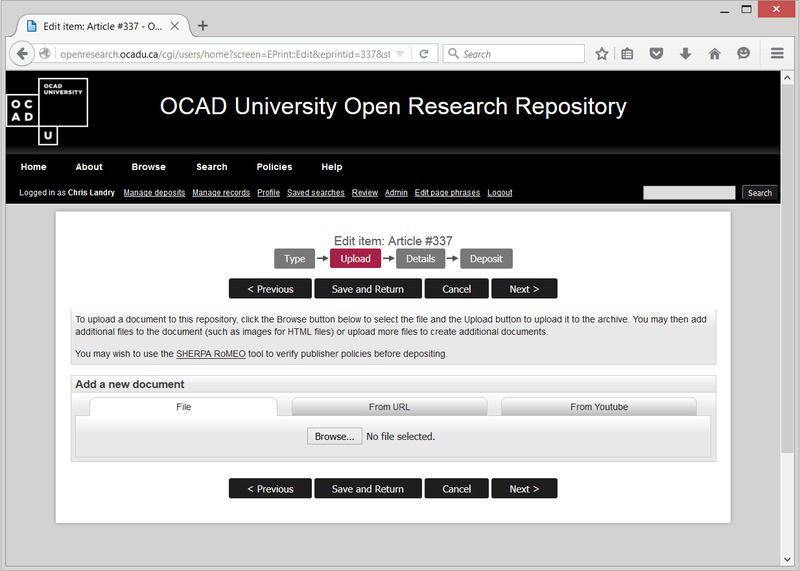 Be sure to read and understand the OCAD University Research Repository Non-Exclusive License Agreement as you are agreeing to its terms through making this deposit. 4. Navigate to your Item Type and click Next. 5. Click Browse and Upload your thesis or MRP, as well as any relevant supplementary media or image files, using the file name convention: Last_First_year_Degree_Program Acronym_thesis/MRP.pdf. For example, if Tom Thompson defended a Master of Design thesis in 2016 in the Digital Futures program, the file would be named as follows: Thompson_Tom_2016_MDES_DIGF.pdf. Set the terms under which others may use parts of your thesis in their own work by choosing a Creative Commons model license, from the most restrictive, Attribution-NonCommercial-NoDerivs (CC BY-NC-ND) to the most open, Attribution (CC-BY). 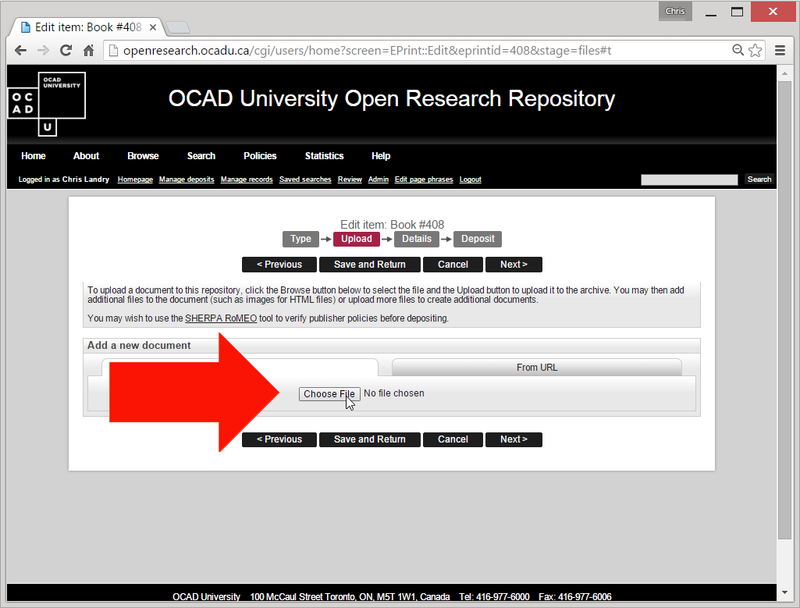 If you have any questions about licenses, contact us at repository@ocadu.ca or gradstudies@ocadu.ca. 7. 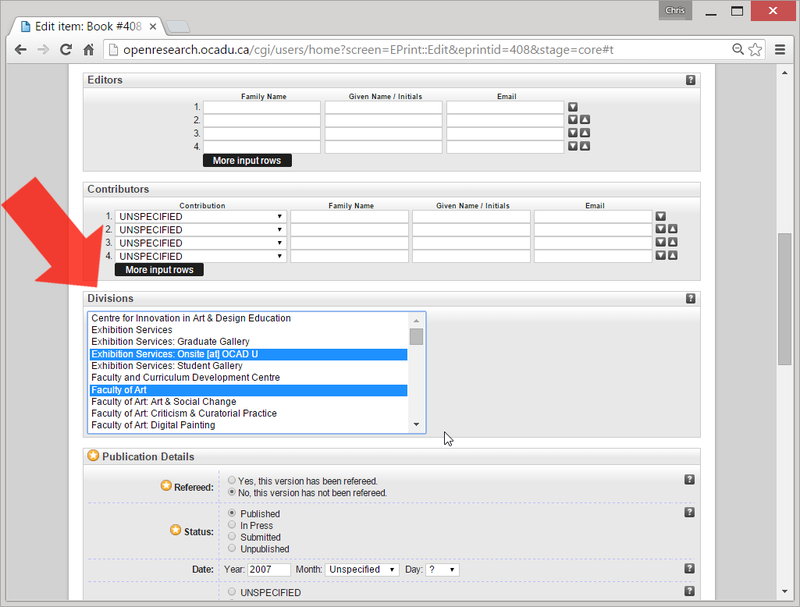 Fill out the appropriate fields under the Details tab such as Title and Abstract. Under Creators it is a good idea to include your email address along with your name. Doing so does not mean your email will be listed in the record, but rather it will provide a unique identifier for you as author in the system. Note: Division refers to faculty, department or research team associated with your thesis or MRP. If more than one of these applies to your deposit you can select multiple divisions by holding down the Ctrl key or the command key on a Mac. Under Publication Details, Status should be Unpublished. The Date Type should be Completion. If you were not required to undergo the REB Approval process please select Not Applicable. For References cut and paste your bibliography and references. 8. Click on Next or the Deposit tab. 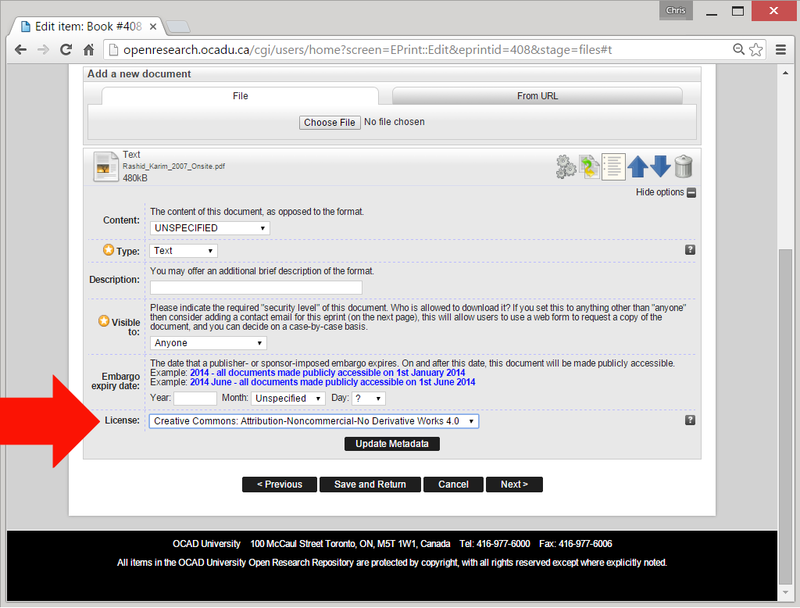 Before depositing your thesis or MRP by clicking the Deposit Item Now button on the bottom left. 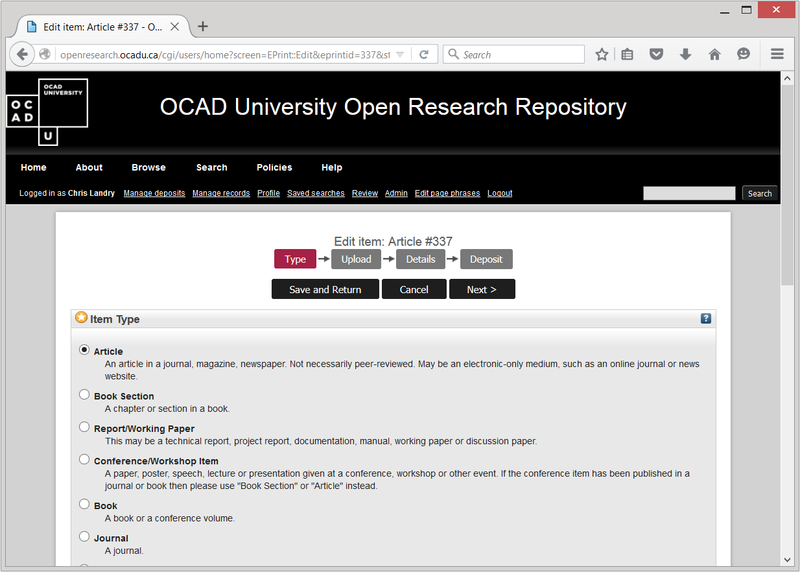 Be sure to read and understand the OCAD University Research Repository Non-Exclusive License. 1. 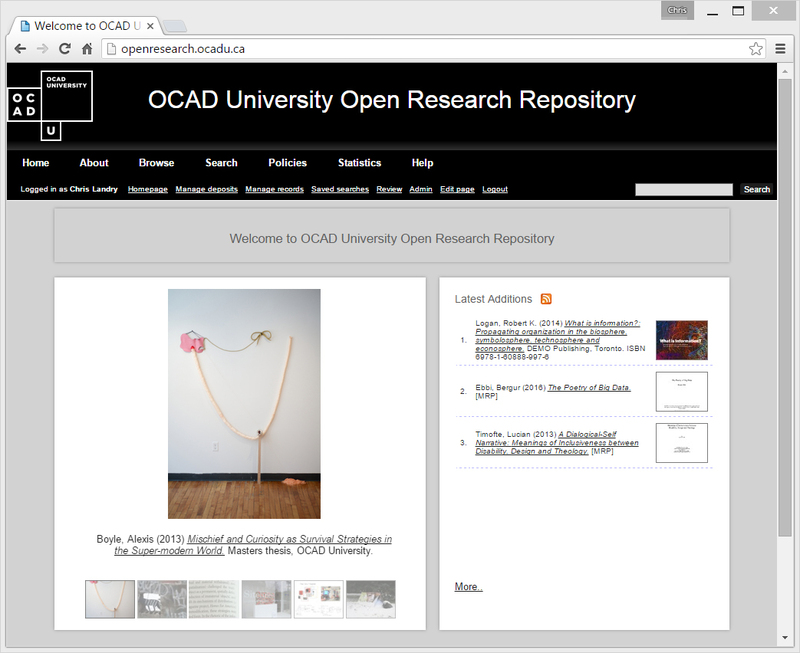 Visit Open Research repository at openresearch.ocadu.ca. 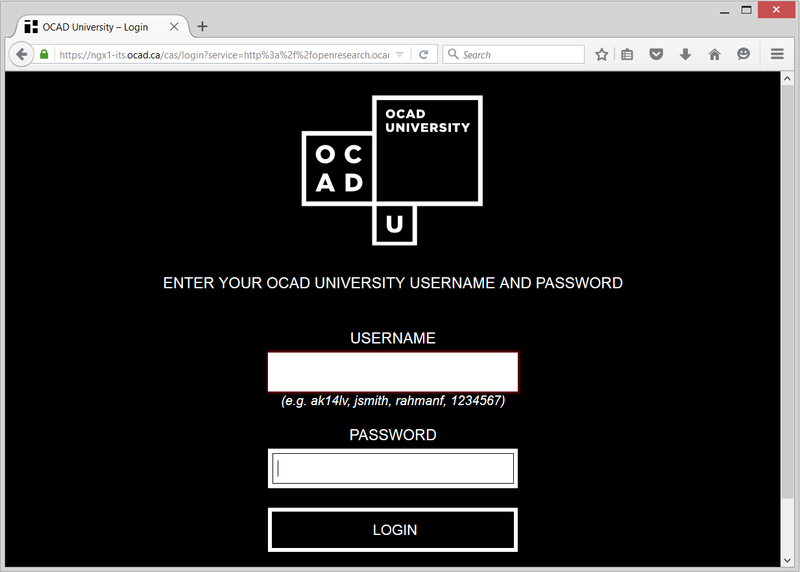 Login using your OCAD University credentials. 2. From the Manage Deposits tab click on the New Item button. 3. Select your Item Type and then click Next. Note: exhibition catalogues are classified as Books. 4. 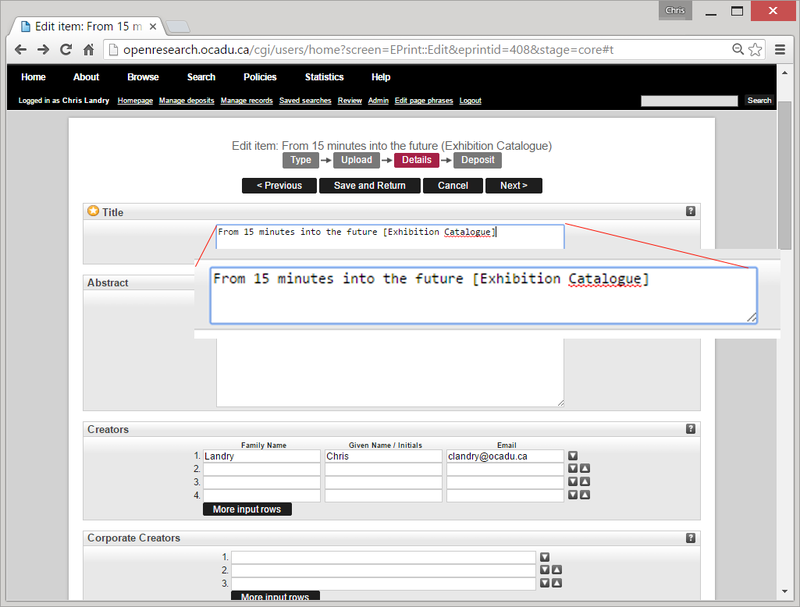 Upload the exhibition catalogue using the file name convention: Last_First_initial_Year_Studio or program_Acronym.pdf. If there are multiple exhibitors, use the first word or words from the title of the show. For example, if Onsite Studio were uploading the exhibition catalogue for their 2007 show, From 15 Minutes into the Future, which featured the work of Karim Rashid, the naming convention would be: Karim_Rashid_2007_Onsite.pdf. 5. Fill in the applicable publication details, particularly the License terms for your submission. Note that on some browsers you may have to click the Upload button again to make these options appear. 6. 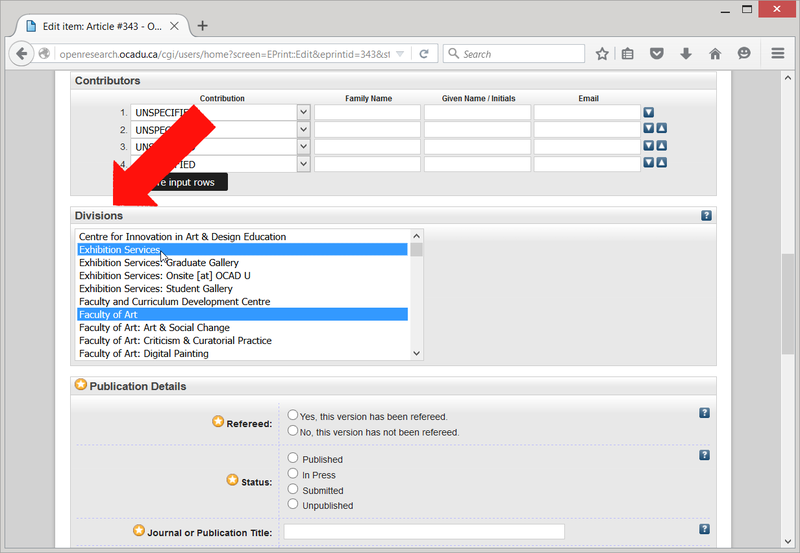 Fill out the appropriate fields, using sentence case for the title followed by the words "Exhibition Catalogue" in square brackets. 7. Note: Division refers to faculty, department or studio associated with your catalogue. If more than one applies you may select multiple divisions by holding down the Ctrl key. If you have any questions about, or require assistance with, any aspect of the deposit process be sure to contact us at repository@ocadu.ca. 3. Select Performance as your Item Type and then click Next. Note: Performance is defined as a music, theatre, multimedia or art performance. 4. From the Upload tab click the Choose File button to upload your files which can include text, images, audio, or video. 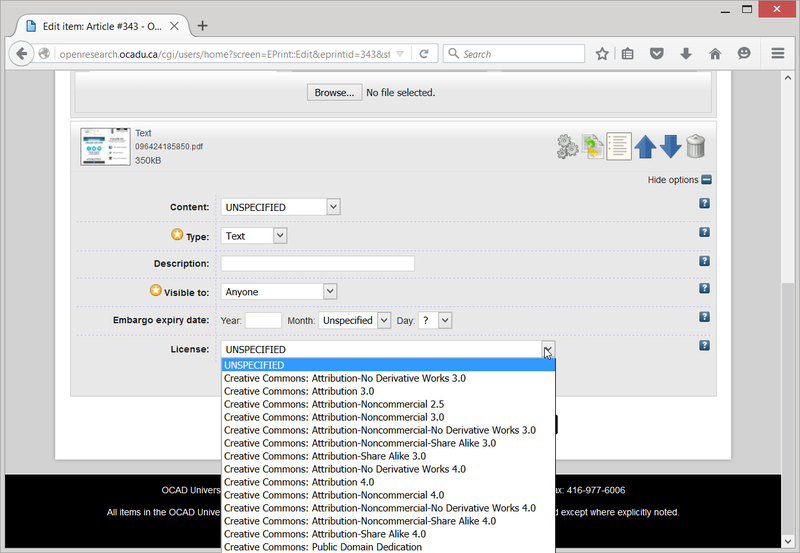 Upload multiple files by returning to the Choose File button. 6. Fill out the appropriate fields. Under Contributors you have the option of indicating contributor role from the drop-down provided. You may include as many contributors as you like. Division refers to faculty, department, or studio associated with your performance. If more than one apply you may select multiple divisions by holding down the Ctrl key on a PC or the Cmd key on a Mac. 7. Complete the process by clicking the Deposit Item Now button. 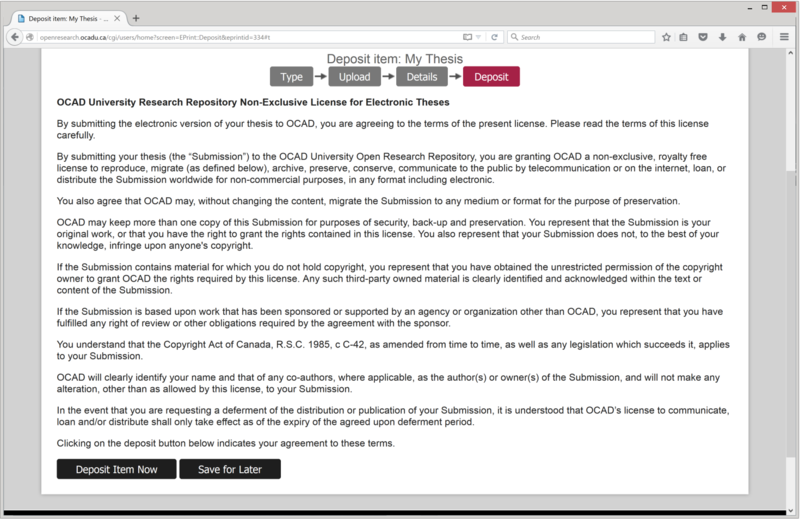 Be sure to read and understand the OCAD University Research Repository Non-Exclusive License Agreement as you are agreeing to its terms through making this deposit. 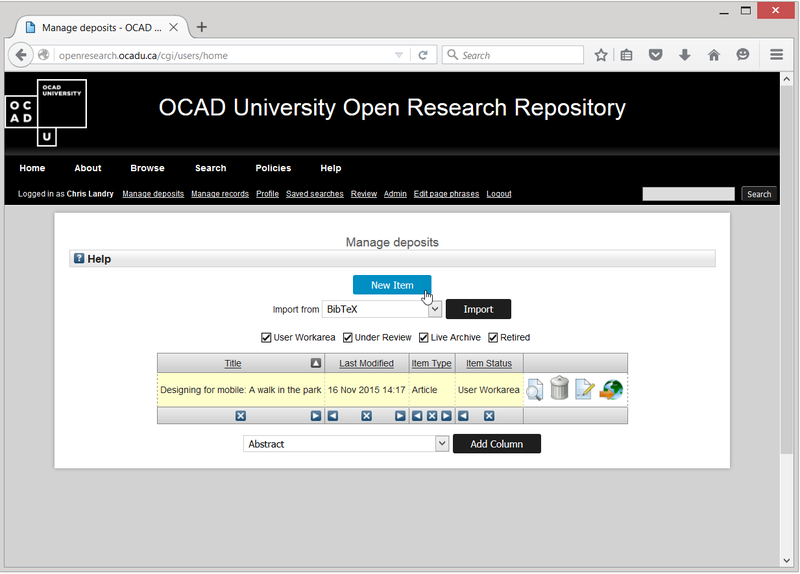 If you have any questions about, or require assistance with, any aspect of the depsit process be sure to contact us at repository@ocadu.ca.